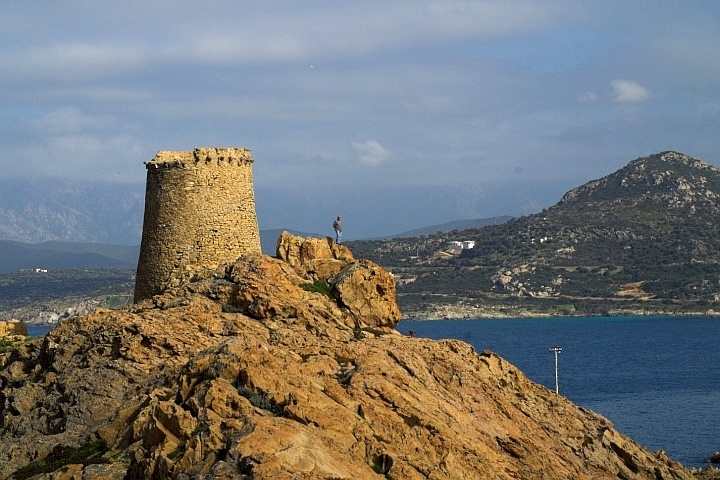 The locations of the majority of Irish Martello towers are at coastal locations and near popular holiday resorts and the towers feature high on the list of local tourist attractions being promoted, showing photographs of the Towers. Others are located on remote headlands and on Islands and even at the present time can only be accessed by sea, with the assistance of local boatmen or on “horseback”, except for those who are well trained in hill walking or rock climbing. Alternative methods of access deprive one of arduous but enjoyable experiences and in many cases the advantage of obtaining local lore that relate to the history of the towers and their uses previously unrecorded. In some instances, the original and official place names of towers had changed with the passing of time and local information was very useful. As I confess to being in the category of an “armchair researcher” I wish to specially acknowledge the authors of many publications that have provided by their research, in the true sense of the word, facts about the Martello Towers in Ireland that are now preserved for posterity. It is deemed to be noteworthy to point out that Martello Towers were not the only coastal defences in Ireland at the time of the threat of a French Invasion. Large military camps and Forts also existed and reinforced by some of the Martello Towers, also approx. 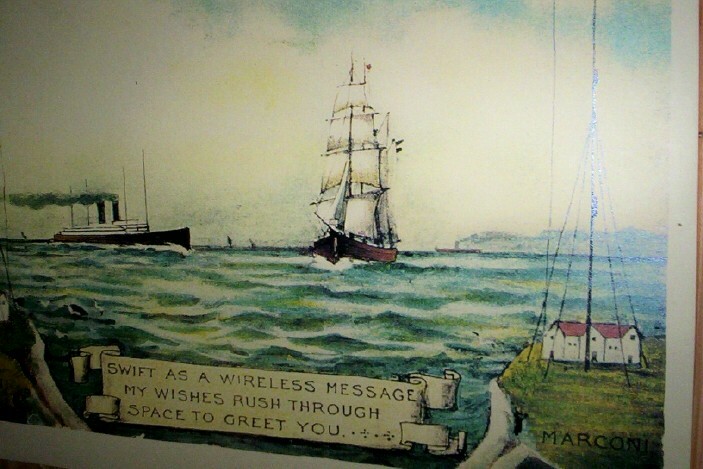 100 Signal Towers were constructed around the Irish Coastline to scan the horizons for unusual ship movements. Care has been taken to have permissions to use many images on the site and to give due acknowledgements and also to show appreciation of the many eminent authors of publications listed ; Webmasters of websites , that assisted my research. A further Chapter in my proposed publication: (The Silent Towers A Guide to the Martello Towers in Ireland ) was also added to show Martello Towers built around the coasts of many other countries and islands to warn of invaders , smugglers and privateers. As time passed, armaments advanced from musket and sword to heavy cannon and it was inevitable that tower design would also change. Martello Towers and signal towers became obsolete as further changes took place, sail to steam and the speed of wireless telegraphy. One of the many old posters on display at the Vintage Radio Museum, Martello Tower, Howth. County Dublin. In 1793 war broke out between the Revolutionary Forces of France and the British, who at that time occupied Ireland. In 1796 General Hoche planned an invasion of Britain, and the capture of Ireland first was the gateway to a possible success. 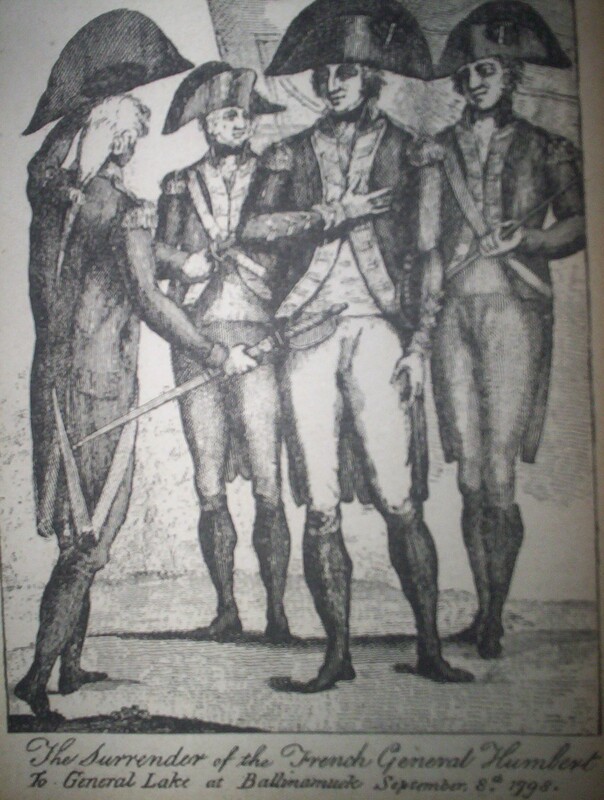 France had already pledged to support countries seeking independence and support for the United Irishmen under the leadership of Wolfe Tone was equally assured of assistance from France. When Wolfe Tone went to France to seek help he was to back-up his request with an assurance that a large force would be ready in Ireland to join up with an invasion force from France. Before the final decision was made by the French to send an invasion force to Ireland serious discussions also took place between Tone and Hoche ,looking ahead of a possible victory over the British and the role, if any, that the French would play in a new Irish Government . This was not an obstacle as General Hoche was committed to helping Ireland gain independence and viewed Ireland as being similar to the independence gained by America with the assistance of the French. General Hoche viewed a victory in Ireland, not as a conquest, but as a guarantee that Ireland would support France in its ultimate goal of the conquest of Britain. Long discussions took place between Wolfe Tone and General Hoche on shipment of sufficient arms that would be required to equip the Irish insurgents, availability of food stocks especially bread and beef and agreement was reached that should the invasion be successful Ireland was to be declared a Republic. General Hohce also reminded Tone that the formidable force he planned to lead would inflict much casualties to opposition encountered and many of his own loyal supporters in Ireland would also perish with consequences of minimising expected support throughout the country as had happened in the French Revolution. Tone was heartened by these humane sentiments as it was also his wish that unnecessary bloodshed would be avoided. British spies in France could also confirm that the French Treasury had allocated large funding to the French Admiralty and reported on preparations that were being made equipping the Fleet. These fears were well founded and the French Fleet did invade Ireland in December 1796, the proposed landing point being Bantry Bay and this failed when a fierce winter storm scattered the Fleet, the disarray and fearing the disgrace of defeat forced the French to abandon the invasion and return to France. Many of the French ships were in Bantry Bay, Wolfe Tone was aboard the L’Indomtable. News of the attempted invasion, though a failure, fuelled the spirit of insurrection throughout Ireland and this spirit climaxed with the Insurrection in Ireland on 1798. Documented accounts of the strength of expected support the French would have received had the invasion been successful do not support this view but emanated from the strong spirit of freedom spreading throughout the country from the North of Ireland. General Humbert’s fears were correct, as another expedition had already left France led by Napper Tandy but when they reached Rathlin Island on the north-east coast of Ireland they heard of the defeat of Humbert’s expedition and returned to France. Another disaster was to follow as Wolfe Tone had left France on the 20th.September with the largest fleet of 11 ships also unaware of all the failings of the previous attempts and four of the ships reached the entry to Lough Swilly on the North coast on the 10th.October. (the remaining ships scattered en route to approach from different directions). On this occasion the British were prepared and engaged and defeated the French at Lough Swilly leading to his capture, together with many other leading members of the United Irishmen. They were taken to Dublin to face trial. These events highlighted to the British the serious lack of fortifications at major crossing points on the Shannon and the real threat of further landings by the French in the North of Ireland. After a short truce, war again broke out between England and France in 1803 and in view of past invasion attempts by the French, the British drew up plans to fortify likely landing places in Britain and around the coasts of Ireland. British spies could again report that Boulogne had become an enormous Camp for a French Army of over 130.000 men and 22,000 landing boats poised ready to invade Britain. The Royal Navy also made known their presence to the French and was ready to prevent the invasion force from leaving French waters. A comprehensive plan of fortifications was approved by the enactment of the National Defence Act 1804 to protect the English coasts from invasion and this plan was also extended to include Ireland. The principal feature of the network of fortifications being constructed on the Coasts of England and Ireland was The Martello Tower. ‘ In 1793 Corsica was in insurrection against the French, and the British Government, as a matter of policy, decided to support the insurgents. 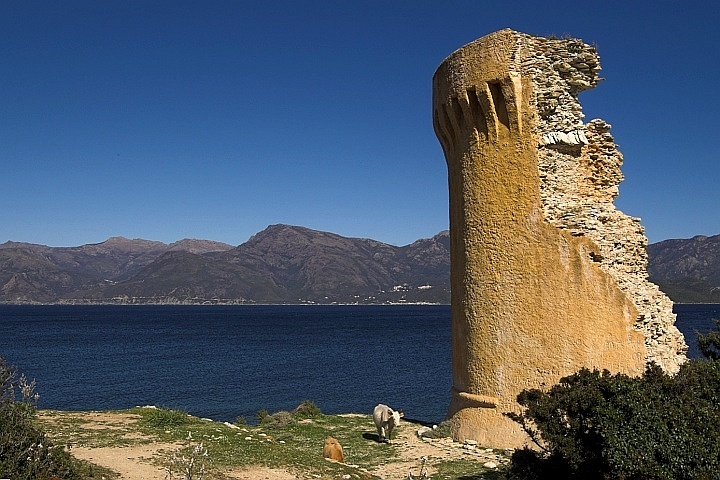 It was arranged to begin operations by taking a tower, held by the French, in a strategic position on Cape Mortella, a headland dominating the only safe anchorage in the Gulf of San Firenzo. This structure was armed with one 24 pounder and two 18 pounders. Accordingly, in September, a British squadron of three ships of the line and two frigates went to the assistance of the insurgents, and the two frigates were ordered to capture the tower. After a comparatively short bombardment it was abandoned by its little garrison and occupied by the British. Some short time afterwards, the French recaptured it, and profiting by their experience, considerably strengthened its defences and armaments. In the following year. 1794, a further attempt was made by the British to support the Corsican insurgents. On the 17th February, a party of 1,400 troops was landed and a determined attack made on the tower the next day. Simultaneously with the attack by land, two ships, the Fortitude and the Juno, bombarded it for two and a half hours, without effect, and then retired, the Fortitude being on fire and having 62 men killed and wounded. The shore batteries continued the attack, but their fire was equally unsuccessful until at length red-hot balls were tried, one of which set fire to the bass junk with which the massive parapet was heavily lined, and the garrison of 33 men then surrendered. The captors were much surprised to find that the armament consisted of only three pieces – two 18 pounders and one 6 pounder. The round gun Tower had been designed so that offensive cannon fire would bounce harmlessly without breaching the walls.’(Chapter XL11 Chapters of Dublin)(Encyclopaedia Britannica(11TH EDITION)..
After much debate and decision, The British agreed to erect a network of similar towers around the Irish and English Coasts at locations agreed to be most vulnerable to attack. 74 Towers were built between Folkestone in Kent and Seaford, 12 miles west of Eastbourne. These are described as the South Coast towers and numbered (1-74) from east to west. A further 29 towers were built on the East coast between Point Clear in Essex and Aldeburgh in Suffolk. They are identified by letters (A to Z, AA,BB..) from south to north. 50 Towers are known to have been built in Ireland. A token selection of towers in England is shown in the Section 8.”Other Countries” with recommendations to visit English tower websites. SCREEN NAVIGATION IN USE. Scroll to top Menu to continue. The Howth Martello Tower Vintage Radio Museum 11 a.m. -4 p.m Weekends during Winter..Entrance opposite Abbey Tavern, Abbey Street , Howth.